Under the supported apps in the list, you will see a mark if the app has an icon available when the feature is enabled. Warning: you need the latest firmware of Mi Band to make this work. 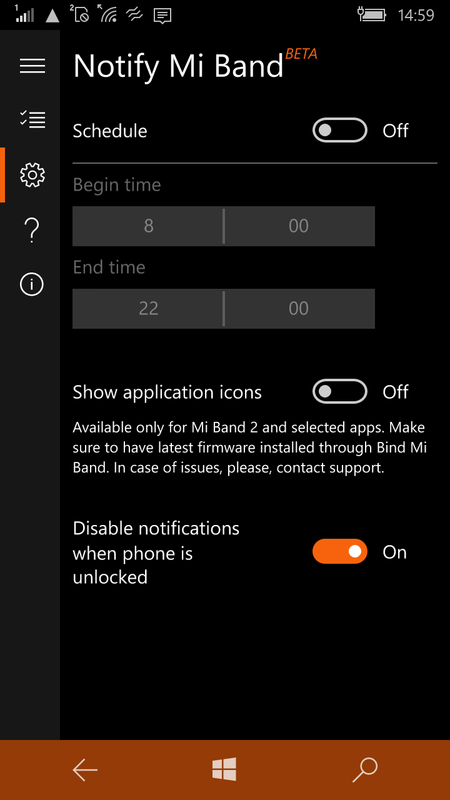 You can always update it with Bind Mi Band app. Please, report if you see any issues with the list above or have candidates for 3rd-party apps for above-mentioned services. Might be handy, since you can sometimes already have seen the notification when it arrives on the band. An owner of Mi Band 1? We didn't forget about you! In this update we added a possibility to assign an extra vibration for some of the apps, which don't have an icon available. 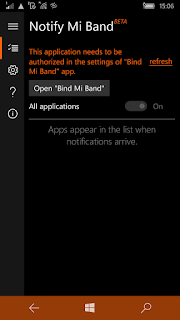 In this way, it can help to distinguish notifications from apps with a higher priority (especially good for owners of Mi Band 1). 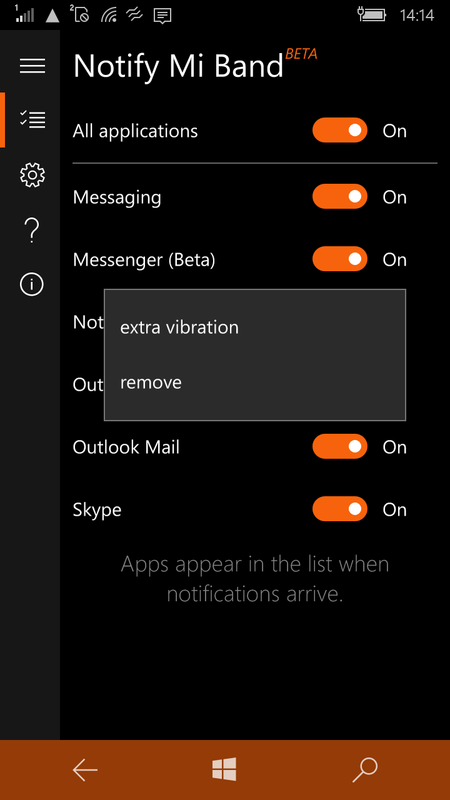 To toggle extra vibration - just tap application item in the list. Btw, did you know that you can also remove apps from the list if you removed it from the phone? Just tap an app in the list and select "remove" option. Also, you will find improved UX and touch responsiveness on some parts of UI, more informative warnings, better onboarding experience. Despite all the rumors, we are still not able to receive incoming calls information from OS. We keep watching official announcements and will try out and ship working solutions ASAP. 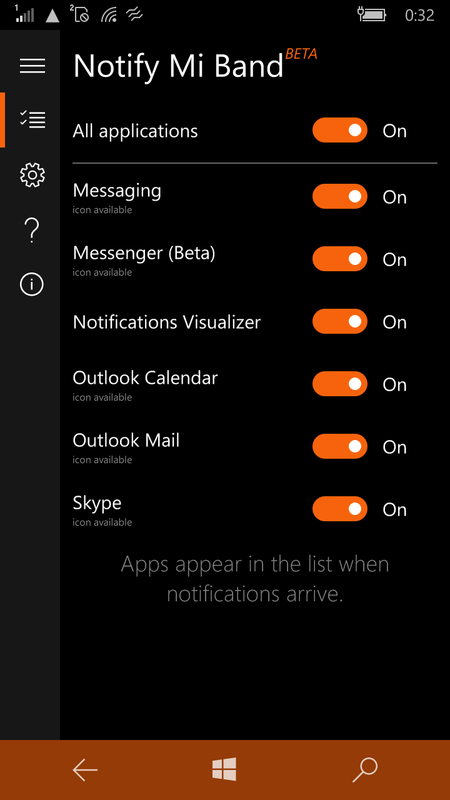 UPDATE 1.3.2: Icons for WhatsApp BETA, Viber (former Microsoft Phone icon), Telegram Preview, separate icons for Outlook Calendar and Outlook Mail and a new missed call icon. When I have messenger notification it puts calendar icon. Thanks! We will release the fix during the day. If Viber icon is supported by Mi Band, we will add it. That's strange, for me it works ok. If I miss a call I get the Facebook Messenger icon on my Band 2. I don't think it's pssible, because Messenger doesn't make notification for missed call (at least for me). Notifying incoming calls (I mean missed calls) doesn't work for me while I have "Disable notifications when phone is unlocked" on. Email app does it do correctly. When I receive email, show calendar icon. Is it right??? That no issue because is same app. Thanks... Im so happy now! You are making a really good job. I am glad I bought the pro version of bind mi band!! My wife update firmware via iPhone (because HM stopped work), and WhatsApp notification have "call" icon. With new update notifications stopped completely, no apps in the list. Don't know how to add them. I did it both, but still no luck. Before update there was no problem. Estou muito contente por ver as coisas evoluindo, bom poder identificar qual é a notificação que está chegando, espero em breve poder ver notificação de ligação em tempo real e se possível com identificação de nome também. Update 1.3.2 is coming soon: icons for WhatsApp BETA, Viber (former Microsoft Phone icon), Telegram Preview, separate icons for Outlook Calendar and Outlook Mail and a new missed call icon. my email notification icon says "app". is this correct? Hi! Is it possible to add a setting about notification duration? To me would be great if notification is shown for 20 seconds at least. Can you do anything with interop tool app? Muito bom cara,esta melhorando bastante. Pra mim,agora so falta adicionar identificaçao de chamadas e opçao de ao distanciar do smartphone,ele avisar pra nao correr o risco de perder. Cara seria maravilhoso esse recurso, se distanciar do smartphone e ter a vibração como aviso!! Could you please add an icon for Unigram? I would really love to see that! No vibreh and call icon when I have a call.just missed call shows the icon!!! Any news about sync error after long time without syncing? It's inconvenient to loose all activity statistics in case if you forget to sync your band for one-two weeks. P.S. My Lumia 930 has developer unlock, Visual Studio with Windows Phone SDK is installed, and I'm ready to provide any help you need or take participation in debugging to resolve this issue. Yep. It's very annoying issue. Author, please fix! Instagram notification doesn't show up, and telegram preview too. Could u add unigram notification as telegram please? Hi. Whats new in 1.3.3.0 update ? Updated icons for Telegram and Unigram, some small fixes. I swapped my Lumia 950 for an OnePlus and sincerely the only app I miss is the bind Mi Band... There is the possibility of making a version for Android? I don't think so. IMO author made app, because on windows platform was gap, platform gap is not present on Android. There are some apps in play store, but none friendly as Bind Mi Band. The official app is a joke. I'm using Mi Band Master, but still miss Bind Mi Band usability. Use MiFit apps from playstore. would it be possible to use default email notification icon also for notifications coming on WM10 via IMAP email account? 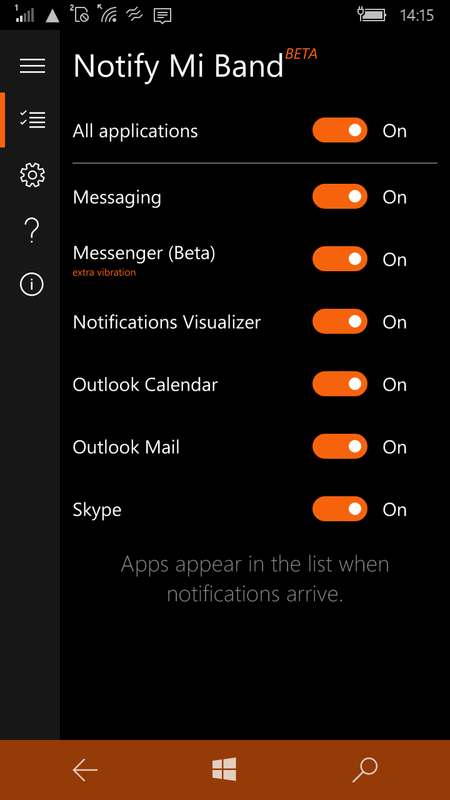 It also seems that missed call notification is displayed only if "Disable notifications when phone is unlocked" is not active. Mi Band 2 user here, on Lumia 950! 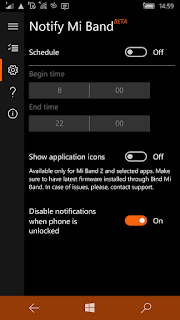 Can you tell me do you have any settings for Mi Band 2 in Bluetooth menu? When I turn off Bluetooth and turn it back on, it won't connect automatically. and dont use insider, use official build 15063 to avoid problems and bugs with BT. Zbunilo me to sto ima kvacica ona kao za dodatna podesavanja, ali nista se ne desava kad kliknem. Uglavnom, shvatio sam da sada radi sve iako mi je samo ukljucen BT, dok pise "nije povezano". Rebootovao sam Mi Band, sada sve uredno radi! Poxa, fico muito agradecido por darem uma atenção para nós usuários do Windows 10 Mobile. Excelente aplicativo! Parabéns. When will be released Mi fit apps for Windows Phone? For the incoming call, what we have to write to Microsoft to unlock windows API? With this feature that is all perfect! How much is thah update cruicial for Win 10 mobile users? I've got my band yesterday, all works fine but I'm not receiving notifications for Telegram (official client). It does not appear in the Notify Mi Band app. Unigram works but at the moment I still use the official client because of stability so it would be great to geti it working also. It's a bug in OS that prevents us from getting data for Telegram and VK. How can I check the kilometers amount of past days? Is there any place in the application that shows it? This is coming in next update soon! Text on Mi Band 2 still not possible on Windows OS? 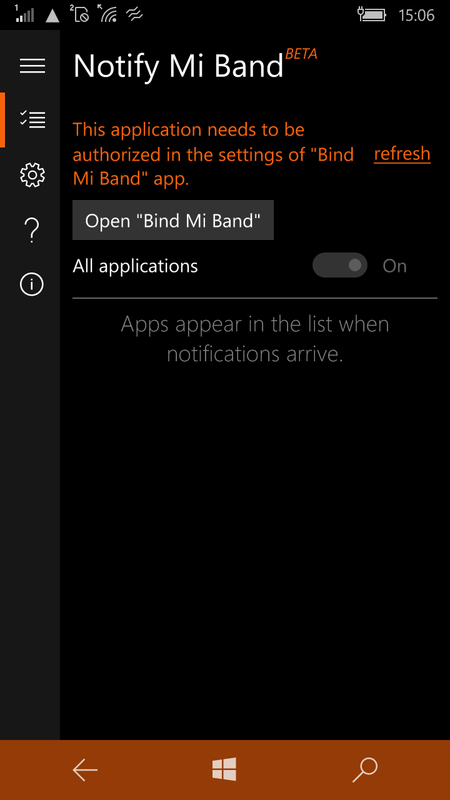 It might be, but right now working on Bind Mi Band update, not Notify Mi Band. I get the message from my Lumia950 XL: "Your MI band is connected to Windows phone and ready to go!" Combine. But even after 10 x times and more only the error message comes with: try again, or ignore. Remove band in Bluetooth settings and add it back. PRO TIP (concerns everybody): Next time, please, write on support email. Your chanses to get response in reasonable time rise up to 99%. It works. The problem was the server - I. If it vibrates you must tap on the sensor and not the display. Whats new with the incoming notification? and, can you put a Cortana icon notification? Thanks. There are some clues that calls notifications might be happening, but not promising anything here yet. We don't have icon for Cortana on the band. I bougth a mi band 2 and use it with my lumia 650. It is works perfectly. 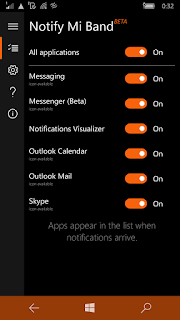 I red maybe the future (depends on Microsoft) will solve the incoming call notification. Only this is what is missig from this app. And my last question: will be there facebook icon for the facebook notifications? Because at this moment no icon FB icon only app icon. Re calls: see comment above. Please, contact support with your question regarding facebook and include logs from the app. Then we can figure it out. thank you for the notifyer app 1.3.3 in the first place!